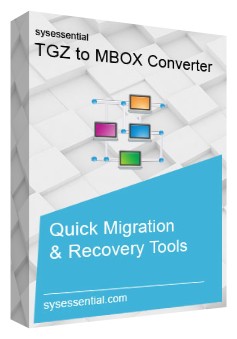 Free download edition will remove all the queries as demonstration of the software supports migrating first 10 emails from every item into MBOX file format. Sysessential for TGZ to MBOX converter tool provides the facility of getting preview of the TGZ files along with email attachments before importing into MBOX file format. The preview will provide you complete idea how software exactly performs data migration. Tool provides with the option to export Zimbra contacts list into MBOX. It converts details such as name, company’s name, designation, and other related info without any alterations. If you wish to convert Notes, events, Notes etc then this can also be performed with ease. The application uses useful and hassle-free conversion methods. It performs data migration via advanced algorithms and latest techniques. Thus, conversion has made comfortable for so many users including tech-savvy and less techie guys. Sysessential for TGZ to MBOX converter application supports for converting all the contacts details separately for ease to access the contacts in a separate folder. The conversion is done without causing any changes at all. Users can save the converted data into desired location. User can created new folder and save data for ease in further data accessibility. This established software tool has ability to move away bulk of TGZ emails into MBOX file format. File size issue does not exist at any point even if bulk is in bulk. Thus, get ready for making safe migration without bothering about quantity of data. Users are recommended to make use of batch conversion feature as an advantage for saving time. The conversion of multiple files at one go will save immense of the time especially in the organizational platform where data is in bulk. Software provides the facility to test the working process in advance and this is the reason, it provides option to click Download Now button and check out all the features and process exactly executed. The free of cost trial edition will make migration of first 10 files from every item into MBOX file format. Data integrity is the first thing that tool cares for. This is the reason, when users export data; integrity is assured to be maintained. Where to contact in case of solving any hurdles? On what principle software works? Software works on the principle of converting bulk data into MBOX files or else the conversion of selected data. This is a time saving option when users want only few files to get converted rather than all. Is conversion process manageable via non-techie guys? Software steps are simple and understandable. Users from non-technical background can also implement different features for avoiding conversion problems. Thus ensure for making swift migration even without technical knowledge. Will software save converted into location that we have chosen? Yes, the application comes with the ability to save converted files into any of the desired folder. The resulted MBOX file can be saved into a new folder as well so not to worry. I was using Zimbra emailing application but now looking to switch onto some other one. After discovering inside out about the email application, I decided for Eudora. But the problem is to migrate bulk emails from TGZ into MBOX file format. I do not know the way out for managing the matter and this is why decided for using professional utility such as Sysessential for TGZ to MBOX Converter for availing far-fetching results. Sysessential for TGZ to MBOX Converter was my first experience to make use of third-party software tool. Though there were many commercial applications for this purpose, but I decided for buying only this tool because of several exceptional qualities. It offers facility to migrate data comprehensively. Also it offers benefit of saving data into separate/desired location. I also liked speed of the tool which is versatile and effective to use.